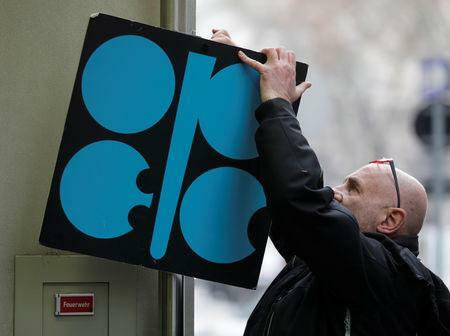 BAKU (Reuters) - Saudi Arabia said on Sunday OPEC's job in rebalancing the oil market was far from done as global inventories were still rising despite harsh U.S. sanctions on Iran and Venezuela, signalling it may need to expand output cuts into the second half of 2019. Russia, which is cutting oil output in tandem with OPEC, also said production cuts would stay in place at least until June, when Washington's next steps on reducing Iran's and Venezuela's oil exports become clearer. The United States has been increasing its own oil exports steeply in recent months while imposing sanctions on Venezuela and Iran to reduce their shipments to global markets. Washington's policies have introduced a new level of uncertainty for OPEC as it struggles to predict the balance of global supply and demand. "My assessment is that the job still remains ahead of us... We are still seeing inventory builds... We need to stay the course certainly until June," Saudi energy minister Khalid al Falih said on Sunday. "We like to remain ready to continue monitoring supply and demand and do what we have to do in the second half," said Falih as some OPEC ministers met in the Azeri capital of Baku for the monitoring committee of OPEC and its allies like Russia. OPEC and its allies have cut output by 1.2 million barrels per day - or 1.2 percent of global demand - since January to help rebalance the global oil market and prop up prices. OPEC is due to meet in April and then again in June to decide its output policies. The United States has imposed stiff sanctions on OPEC's third largest oil producer, Iran, but has given some waivers to buyers of its crude until May. Washington is also trying to oust Venezuela's current president, Nicolas Maduro, and has imposed sanctions on that country's oil. Russian Energy Minister Alexander Novak said it was hard for Moscow and OPEC to plan due to the U.S. sanctions. He said they would have little additional information by their next meeting in April, given that Washington will not yet have announced its new waivers on Iran and that more talks would be needed in May. "Those sanctions are creating negative trends in the market and are completely distorting the supply and demand picture... They are imposed to help sell goods of the country that is imposing the sanctions, and they create uncertainty," he said. Russia has been slow to cut its oil output in line with January targets, saying it is difficult to do so in winter. Saudi Arabia has therefore cut its own oil output to well below its targets to compensate for other producers but Falih said this would not "continue indefinitely". Novak said Russia was now approaching full compliance and was close to cutting 140,000 bpd. Falih said Saudi exports would remain below 7 million bpd in April and March.